As a strategic business consultant, your clients may be very clear about the goals they want to accomplish and the benefits they want to reap, but they may not be quite so clear about how to actually achieve those results. Consequently, each day, your work product is designed by analyzing, defining, and meeting your clients’ expectations, and those are constantly changing based on the work that your client does. Whether you are managing one or multiple clients, you are probably performing a wide variety of services, all under the title of "consultant," that differ significantly from one project to another. Capturing the full cost of your work may be more complicated simply because the value you offer is spread across so many disciplines and industries. Strategy creation guides a corporation's sustainability, underscores its competitive advantage and generates its potential for profitability. Professionals who offer strategic consulting services must be able to scrutinize all the disparate elements that go into their client's businesses, then craft a way forward that will allow that company to grow. Ergo, the strategic consultant is often the master of many skills, each of which provides a distinct value to the customer. Accounting for those services in a way that maximizes their value for both the professional and the client is, in itself, a valuable skill-set. They bring a diplomatic approach to enterprise concerns. Unlike a shareholder or employee, the strategic consultant looks past the boundaries of typical corporate sectors to see the bigger picture - and the gaping holes. They offer an unbiased perspective that is informed by their years of experience and expertise. They bring a results-oriented focus to each project, helping their client to fulfill their goals. Each aspect of the strategic consulting process offers economic value; capturing, recording, and billing for that value keeps the consultant in business, too. Consolidate your financial and project accounting into one streamlined and centralized system. 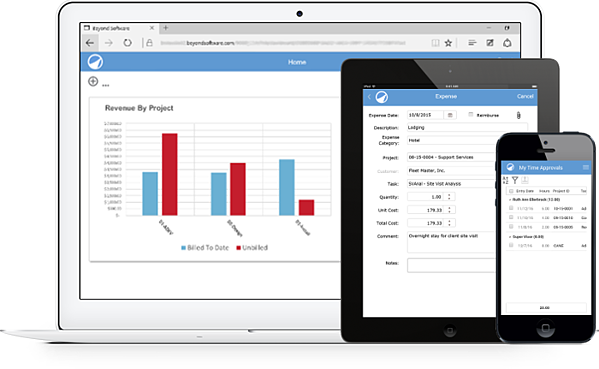 Manage your resources - assign tasks and projects, set budgets and customize billing rates. Track billable hours on a per-project basis from any device with our mobile time & expense app. Generate highly customizable invoices to bill your clients, whether on a percent complete basis, by milestones or a recurring schedule. Report on all aspects of project performance, as well as standard financials. You've built your career around strategizing the future. Beyond Software ensures that you can capture and capitalize all the value you provide to your clients and customers today and tomorrow.